All meals served with fried rice, wonton and fortune cookies; except for Lo Mein – Fried Soft Noodles and A La Carte. Marinated chicken with snow peas, carrots, yellow onions, water chestnuts, and stir fried in a hot spicy curry sauce. 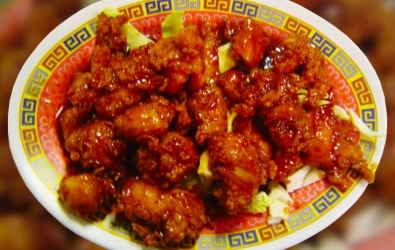 Tender chicken with green peppers, yellow onions, carrots, water chestnuts, and stir fried in a house hot spicy sauce. Fresh shrimp stir fried with snow peas, yellow onions, bamboo shoots, water chestnuts in a light cream sauce. Due to many requests we have recently made this a permanent addition to our menu. This dish is made from freshly breaded chicken stir fried with our delicious special lemon sauce. Fresh shrimp combined with tender chicken gently tossed with water chestnuts, carrots, yellow onion in our special hot & spicy sauce. A perfect combination. Freshly breaded chicken with broccoli, water chestnuts, carrots, and yellow onions with our house specialty sweet & sour sauce with the perfect amount of spice. All time favorite of tender beef steak, broccoli, water chestnuts, and yellow onion stir fried with our house sauce. We’ve added this to our menu due to popular demand. A perfect combination of our famous Cashew Chicken with fresh vegetables, simply delicious! This dish is a very colorful dish served in a cream sauce perfect with Shrimp, Crab meat, snow peas, yellow onions, carrots, water chestnuts, and bamboo shoots. Gently marinated chicken with the perfect vegetables for this dish. They are Carrots, yellow onions, mushrooms, water chestnuts, and bamboo shoots all served in our special sweet & spicy house sauce. Great combination of meats and vegetables come together to make this fabulous dinner. Chicken, beef, Shrimp, Crab meat, broccoli, yellow onions, carrots, water chestnuts, bamboo shoots stir fried in our house sauce. This is similar to our House Combination just without the Crab. A very delicious meal! For those who enjoy a mouth watering combination. Tender slices of chicken stir fried in a perfect combination of freshly squeezed oranges and a sweet & spicy house sauce. Tender slices of beef stir fried with yellow and green onions in our special Chinese BBQ sauce. Very Good! This dish is the perfect pick if you’re just not sure what you want but want something a little different. A great combination of tender chicken slices mixed with fresh broccoli, bamboo shoots, water chestnuts, carrots, yellow onions in our spicy house sauce. Remember, you can determine the amount of spice to this dish. I love the uniqueness of the flavors in this dish. This dish has thin slices of tenderloin pork stir fried with the perfect amount of crunch from cabbage, green peppers, and carrots in our special spicy sauce. Makes my mouth water thinking about it! A local favorite! Tender slices of chicken stir fried with green peppers, yellow onions, and carrots in our special hot & spicy garlic sauce. All I can say is, “You will never taste anything like this anywhere else!” As for the description to this amazing meal…freshly breaded chicken stir fried in our “Secret Sauce”. We served this to our friends and they were so thrilled with this dish that we have made it a part of the Cashew Inn menu. 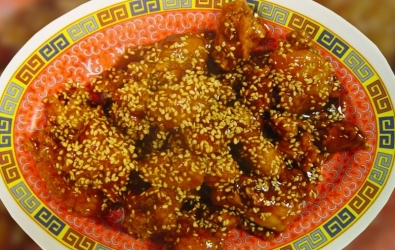 The comment was that is had the perfect crunch and tenderness to the chicken with the perfect tasting sesame sauce. We agree. You may see that we have only two items on our children’s menu and wonder if we are a children friendly restaurant. One of the best things about owning a restaurant in the same location for so many years is being able see our kids and your kids grow up through the years. This year, 2006, we will be celebrating our 18th Anniversary in Nixa. In the 18 years it has been fun to see the little ones go from ordering our Famous Cashew Chicken or Sweet & Sour Chicken and many times even both, and then one day trying something else; just like their lives going from infants to young adults has been so much fun to see and be apart of. The summer and holidays are a special time for us because it is like a homecoming. A lot of our “kids” are off to college and when they come home to visit their families, they come and give us a visit. We feel very privileged when we see the faces of our “kids” visiting!